Best hostel in Croatia for 2010, winner of HW Hoscar award in London 2011 and best in Dubrovnik for 2015, 2016 and 2017 by Tripadvisor Certificate Of Excellence! Best value for money and very unique and authentic atmosphere guaranteed! When you book in here you book very social genuine experience and value for money. Seeing this gorgeous and unique city from locals perspective is lot of fun! Try us! We are hardworking and proud local family which managed to offer authentic experience our dear guests deserve-warm and cozy atmosphere of respect and responsibility. 40 years ago our family dedicated our professional and personal life to offer you genuine experience, and the way we treat everyone is reflecting on us as we believe in karma and nature of altruism and love. We are humans, we are spiritual and nature and animal lovers(we own very cute lab dog, cat and we will not throw rock on birds despite someone once complained that birds from garden are awaking them in the morning) Although we are very resilient we dont allow someone „throw rocks“ on us by disrespecting us or guest of ours. This homestay is not very suitable for just stop overs, anyone into BOOZE CULTURE, alcohol is not allowed here except beer or two and occasionally - welcome drink, public holidays, our guests birthdays etc. Strong liqueurs are not allowed at all. We want to be sure our guests have best experience and good night sleep since we know how restless can be to be on the go constantly. Come chill with us and have a good rest! Feel real difference! We offer value for money, so there is no extra tax charge here, no extra charge for parking for your minibus, car or bike - its free and always available, no extra charge for lockers, food lockers, luggage storage service , no charge for linens, towels and beach towels, even inflatable kayaks, wet suites and fishing equipment are free if you nicely ask us and its available at time. See you soon and welcome! Very short stay but the entire family was super accommodating and friendly, felt like a home away from home. Very peaceful location, as stated it’s not in the centre but we didn’t mind the walking nor the driving as we knew what we were in for. Very tidy and clean, has a lot of personality didn’t feel just like a hostel. Croatia was our first time staying in hostels and hope future hostels would be just as good as our stay here. I highly recommend! I was the last guest of the season, so I cant vouch for the social aspect, but the place is great. It is ran by a family, and I loved getting to meet them. Clean, easy to get to bus, free parking. Thanks for a great stay! Probably the warmest welcome I ever received in a hostel. Lovely hosts! Would always come back. Lovely lovely couple who runs the place! My bus got in 3 hours late from the border crossing and they waited up for me to check me in! Also offered us late-arrivals streusel and stories late at night. I only stayed one night as a stopover but I am confident that any amount of time extra would have been enjoyable to stay here!! Beautiful people, beautiful place. Highly recommend! I was extremely pleased with the service at this hostel. We had a late bus and so it was a late check-in for us, but they were very accommodating. We were originally supposed to stay in a dorm, but since we went during the low season, they put us in a private room with it's own bathroom which was amazing, The location wasn't in town, but they instructed us on how to get bus tickets and it was super simple to get to and from the city center. 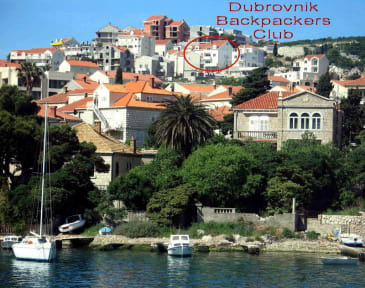 I stayed in dubrovnik backpackers club for two nights.. It is close to the copacabana beach.. But a little far from old town.. But the public transportation is excellent and can be reached within minutes... The host family is very nice and friendly. Loved staying there. The family that runs this hostel is lovely and their dog is so calm and nice. I stayed in one of the ground floor rooms and really enjoyed my stay. The place was really calm, but I ended up there during the offseason. The oldcity is easily accessible using public transport and there's a grocery store only 10 minutes away by foot. It was really nice to have an exterior kitchen as well. A great hostel! The woman who owns the hostel is so lovely, really makes you feel at home and looks after you. Informing you of all the relevant activities to do and where to get buses etc. The only down side was that you have to take a bus to the old town which is the main attraction, or you can walk for an hour. But we really loved the location, its quiet with nice views and a short walk down some steps to the promenade. Overall a really pleasant stay and gorgeous place to visit 😁 would stay again! Staff are very friendly, but the location is kinda inconvenient. It's a 20 minute bus ride away from old town, and all the shops. The building is laid out weirdly. My room was on the 6th floor and the kitchen and common room were in a separate building on the 1st floor. Very hard hostel to socialise in.